Vietnamese and Chinese boats dredge sands in Tatai River in Koh Kong. Secret meetings between high-ranking Thai and Cambodian officials to solve the demarcation of disputed offshore petroleum resources took place during the administration of Thai Prime Minister Abhisit Vejjajiva, the Cambodian National Petroleum Authority revealed yesterday. In a statement some commentators described as “coordinated attack” by the current Cambodian and Thai governments against political opponents, it also claimed there have been no such discussions since the election of Puea Thai in July. The two countries first signed a memorandum of understanding on joint management of the Overlapping Claims Area in 2001, with a joint working group discussing further details from 2001 to 2007. The MoU for managing the OCA, which is thought to hold significant oil and gas reserves, was put on hold by the Thai government in November 2009. “Even during the past few years when the [joint working group] did not meet formally, the Abhisit government continued to engage the Royal Government of Cambodia in negotiations on the OCA on multiple occasions …” the statement said. Discussions had been held by high-ranking officials including Prime Minister Hun Sen and Deputy Prime Minister Sok An, and Thai counterparts such as former Deputy Prime Minister Suthep Thaugsuban and former Minister of Defence Pravit Wongsuwan, it said. Those meetings took place between June 2009 and July 2010 in locations including Kandal province, Kunming, China, and Hong Kong, according to the CNPA. Suthep Thaugsuban at the time “indicated a strong preference to resolve this issue during the mandate of the Abhisit government,” and was instructed to do so by Abhisit Vejjajiva himself. The CNPA claimed that Abhisit Vejjajiva had “wildly accused [deposed former Thai Prime Minister] Thaksin Shinawatra, who openly worked with Cambodia, of having secret interests with Cambodia”, adding that Abhisit Vejjajiva is now “attempting to derail” any future talks between Cambodia and the newly elected Thai government. “Cambodia is obliged to reveal this secret in order to protect the interests of Cambodia and H.E. Thaksin Shinawatra against the baseless allegations made on the part of the Democrats,” it said. Although representatives from the Thai Democrat Party could not be reached yesterday, some expert observers questioned the overtly political nature of the statement. Pavin Chachavalpongpun, lead researcher for political and strategic affairs at the Institute of Southeast Asian Studies’ ASEAN Studies Centre in Singapore said the statement could be the result of political maneuvering by the governments in Bangkok and Phnom Penh. “I should think that this is a coordinated attack between Cambodia and the Yingluck government in discrediting the Democrat [Party] and at the same time enhancing their position at home,” he said. OCA negotiations most likely will not be hurt by recent claims from the Democrat Party, he added. In fact, he said they may result in greater transparency as Cambodia and Thailand look for an equitable solution. Regardless, the issue will remain unsolved until the two countries find a solution to the disputed area around Preah Vihear temple, said Christopher Larkin, managing director of political risk consultancy CLC Asia. He added that the OCA was a “very politically unpopular issue” in Thailand, and that compromise of any kind carried with it serious political risk. 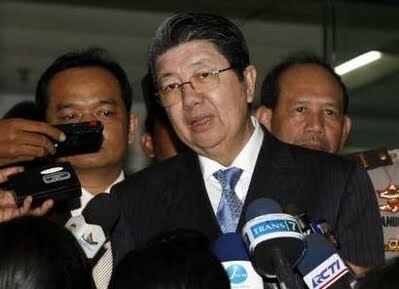 The CNPA’s statement also highlighted claims from Democrat Party Member of Parliament Anik Amranand last week, who it says accused Thai Prime Minister Yingluck Shinawatra’s government and Cambodia of meeting in secret to negotiate over the OCA for reasons of personal rather than public interest. The CNPA yesterday denied such meetings took place, though added it hoped talks would openly resume soon. “So far, the newly formed government led by Prime Minister Yingluck has not yet held any meeting or raised any proposal with the Royal Government of Cambodia to resolve the OCA, let alone any proposal to settle the dispute in exchange for any private individual gains as alleged by” Anik Amranand, it said. BANGING tables and demanding answers, 47 families that have been cut out of the Boeung Kak compensation deal protested at Daun Penh district’s Srah Chak commune office yesterday. The families from villages 6, 22 and 24 have been denied land titles they were promised within a 12.44 hectare relocation site that was set aside by Prime Minister Hun Sen earlier this month for 756 families forced to make way for a real estate development. Waving an invitation to apply for a land title stamped by Srah Chak commune chief Chhay Thirith, Chea Sok Choeun from village 22 yesterday demanded he explain why she had been cut out of the deal. “Where is the transparency and justice if we have the same invitations but some got [titles] and some were rejected,” she said. Chhay Thirith said that such decisions were beyond his authority. Srah Chak deputy commune chief In Saphorn said she supported the families’ claims but was powerless to act. The dispute at Boeung Kak has raged since Shukaku Inc, a company owned by ruling party senator Lao Meng Khin, was given the right to develop a 133 hectare real estate project that would displace some 4,000 families in 2007. MALAYSIAN firm Lion Forest Industries Berhad plans to acquire 58,000 hectares of land in Kampong Thom province for US$26.1 million, the company announced yesterday. The company has also announced its intention to purchase 9,995 hectares of land in Preah Vihear province for $3.9 million, according to a previous statement. LFIB, which distributes building materials, petroleum and automotive products, will use the land to plant oil palm and rubber, a company statement said. The move comes after LFIB over the past year has disposed of its tyre operations in Malaysia and China and seeks to identify a new core business, according to the statement. LFIB will partner with domestic firm Seng Enterprise on the deal, with Seng Enterprise helping LFIB to attain the economic land concession from the Cambodian government. Seng Enterprise will assist six wholly owned subsidiaries of Harta Impiana, which itself is a wholly owned subsidiary of LFIB, to buy land rights at $450 per hectare for a period of no less than 70 years. Each of the six subsidiaries will purchase 10,000 hectares or under, the filing said. Land concessions can be no larger than 10,000 hectares, according to Cambodian law. The deals are expected to be completed later in 2011, it said. Cambodia’s Bokator squad which will test their skills in Malaysia. The fighters will be taking on other martial artists from around the world and are expected to do well. For the first time in history Cambodia’s Bokator warriors will pit their fighting skills against rivals from different martial arts background away from home. Adding a new dimension to this epoch-making expedition to Malaysia for a mixed martial arts competition from September 10 to 12 is the presence in the team of a foreigner, Antonio Graceffo, popularly known as the Brooklyn Monk, who holds a black kroma in Bokator. The four-member Cambodian team, which besides Graceffo comprises big guns Say Teven, Tun Serey and Kong Ravy, is heading to Selangor for an MMA fest with a fearsome name – Mayhem 2 – which the organisers claim is Hell in the Cell where the fights take place in a steel octagon cage. “Bokator fighters had never gone out of the country to fight other martial art forms and this mixed martial arts show will be a whole new experience in their lives for them,” Antonio Graceffo told the Post yesterday after an intense training session at the K-1 Fitness and Fight Factory near the Olympic Stadium. “I think the Cambodian Bokator fighters will do well in Malaysia and adapt themselves to mixed martial arts, although they will be called upon to do lot of things differently. Some of the native techniques will definitely be of advantage like the use of elbows Bokator fighters are so good at. “What they are up against will be a combination of boxing, kicking and wrestling within a confined space and they need to make some adjustments to get into this mould,” added the 44-year old Antonio, a heavyweight at 94kgs. “I strongly feel that the best way to spread Bokator and popularise it is to encourage fighters to get into mixed martial arts. “I feel it is a great honour to be representing Cambodia in Bokator. I have pursued different forms of martial arts all over the world. That’s my passion and that’s what brought me to Cambodia nearly six years ago. Rules here do not permit two foreigners to fight in Bokator. One of the contestants will have to be a Cambodian,” said Antonio, who will be having his first professional fight in nearly five years. Grandmaster San Kim Saen, whose name is synonymous with Bokator, feels this trip to Malaysia could well be a tipping point in the history of the sport. “So many techniques are the same and I think our fighters will do well. It is an exciting change and the one we all are looking forward to,” said San Kim Saen, who heads the Cambodian Bokator Federation. “Thankfully the three Cambodian players will get their passports in time and we are ready and eager to go,” said San Kim Saen, who is expected to accompany the team. While Say Teven, Tun Serey and Kong Ravy have been training at the Bokator Academy for more than a month in a traditional way, Antonio roped them all in last week for a grueling fitness session with Alvaro Lealdela Torre, the lead grappling instructor at the KI Fitness and Fight Factory. Thanks to a generous offer from David Minetti of Team Minetti, the owner of the Factory, Antonio has been going through the grind with Alvaro, as tough a fitness guru as you can imagine. “For us it was a whole new world,” the three Cambodian fighters said in one voice after their hour-long session with Alvaro. “Apart from fitness, Alvaro passed on some valuable tips on fighting techniques. The experience was great,” one of the fighters said. The 28-year old Kong Ravy, who weighs 65kgs and stands 1.66m, won the National Championships in 2009. The highly talented Say Teven has eight Bokator fights behind him. The 25-year old fights in the 68kg class and is expected to do well in Malaysia. The 25 year old Tun Serey is considered as the best Bokator fighter in Cambodia. He was the only fighter to last three full rounds against French fighters in an international show at Siem Reap on July 16 this year. “Many of the competitors Tun Serey will be facing in Malaysia may not be as good as the French Fighters,” Antonio pointed out. “It is a tournament. So, we do not actually know who we are fighting. Opponents will be assigned randomly. In the preliminary fights we will have one three-minute round which is meant to be a knock-out (KO), choke or submission (tap out). “In the semi-finals and final we will fight three rounds of three minutes each,” Antonio said. The Cambodian team is scheduled to leave Phnom Penh on September 9 for the three-day event. Cambodian CEO Te Song, left, General Manager Jesmond Chong and Director Michael Chai take time for a pose in front of a mural for the final Harry Potter movie. Photo by: STUART ALAN BECKER. With the smell of fresh popcorn in the air, Malaysian cinema entrepreneur Michael Chai brings out a small plastic box with a handle and pops it open. Inside is what looks like a computer hard drive. On it is the movie Cars 2, which premiers tonight at Legend Cinema on the fourth floor of the City Mall on Monireth Boulevard adjacent to Olympic Stadium. No longer do movie houses have to run celluloid film through projectors. Now comes the all-digital era. The movies on the hard drive come as an encrypted Digital Content Package. “Later on we get a special file that unlocks it and allows us to screen it,” Chai said. Movie premiers are only open to invited guests and usually the general public comes the following day, or anytime during the run of the movie. However, Chai is generous with premier tickets for supporters, reviewers and business associates. “Premier nights are always by special invitation only,” he said. Chai, 37, originally came to Cambodia to sell movies to the few existing cinemas in Phnom Penh – and after having no luck, was on his way back to the airport, and noticed City Mall. “We went shopping and said let's build our own cinema. It was never our intent at the start to own our own cinema. The one at Sorya, Sabay Cineplex, became our first customer,” Chai said. After a few conversations with City Mall’s Taiwanese owners and lots of hard work building three big, sloped, comfortable theatres, Legend Cinema was born, serving popcorn, Coca-Cola, Mars and Snickers bars along with the latest Hollywood movies. Chai is the owner of BEEP Media, part of a group of companies he owns in Malaysia. Chai’s business in Malaysia for the last six years has been focused on anti-piracy work; collateral checks and making sure the cinemas were reporting accurate sales figures. Along with General Manager Jesmond Chong, also Malaysian, Chai is fussy about the quality of the popcorn, importing it from the United States and experimenting for the very best taste for the customers – different varieties for both salty and sweet. Legend Cinema opened on July 7 with the movies Transformers 3, X Men First Class, Kung Fu Panda and Planet of the Apes. Chai has been pleased with the response from the public. Many Cambodians, especially children, have never had a cinema movie experience, which makes watching a movie on TV dull by comparison. Chai and general manager Chong love listening to the squeals of delight and surprise from the Cambodian youngsters, many of them from homes for children on free tickets sponsored by Legend Cinemas, seeing animated films on the big screen for the first time in their lives. Legend Cinema has three theaters; the largest of which seats 320; the middle size seats 270 the smallest has a capacity of 190. “Generally we start at 10am, and there is a film that begins every two hours. Different movies are different lengths. 3D movies take a little longer turnaround, because they have to return the 3D glasses,” Chai said. For 3D movies, patrons are issued 3D glasses which really do cause the experience of depth onscreen, making the action more lifelike and thrilling. Movies cost $4 in general, while 3D movies cost $6. Popcorn costs $1.50, large $2.50, salted and buttered “and I’m very proud of it”, Chai said. “We have people walking in here who come in a buy popcorn and leave and I like this location, it is open, has parking spaces, easy for people to come in and park upstairs. City Mall is brand new and located in the middle of the city. Chai lived in Australia for 10 years, worked in a cinema and studied business systems at Monash University. He loves movies. “I see cinema filling a very big gap in this Cambodian community. That is family activities. What do you do at night? A friend of mine drives his son around town. There’s not much family oriented amusement. I’ve also heard about Cambodians who could afford it will fly to another country to watch a movie. I thought this is nuts. Watching a movie is a great family healthy activity and it fills a really nice gap here and I would like everybody to at least have a chance to watch one on the big screen." Legend Cinema on Facebook is very active, Chai says. “We posted that link from The Phnom Penh Post to Facebook. In 10 minutes I couldn’t get on to The Phnom Penh Post website because there were so many hits." Chai says the Cambodia Minister of Culture is proud of what Legend Cinema has accomplished and he feels fully supported by the ministry. “I’m proud that the studios trusted me enough to give me the movies. We are talking to the ministries about how we can change Cambodia from being loosely operated to being very serious. Chai has a Malaysian wife and a baby daughter, who divide their time between Cambodia and Malaysia. For every animated film that is launched, Legend Cinemas conducts a special screening for needy youngsters from the children’s homes, including CCF, Cambodia Children’s Fund. 60 people from Heart Enterprise Co., Ltd have fainted while working in a garment factory situated in Phum Ang Khum Kantouk, Srok Angsnoul, Kandal. 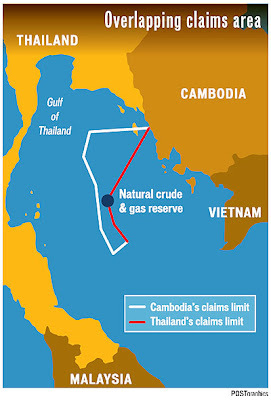 PHNOM PENH, Aug. 30 (Xinhua) -- The government of Cambodia on Tuesday issued a statement announcing that Cambodia is looking forwards to resume the negotiation with Thailand on a plan for joint development of overlapping maritime claims in the Gulf of Thailand for the two countries' interests, according to a statement from the Cambodian National Petroleum Authority. "The government of Cambodia would welcome the resumption of open and official negotiation on this issue and will pursue such a course as soon as practicable in the mutual interests of both peoples and countries," said the statement. "Cambodia has a firm commitment to finding an equitable and transparent solution to the overlapping claims area (OCA)," it added. The statement said that so far, the newly formed government of Thailand led by Prime Minister Yingluck Shinawatra has not yet held any meeting or raised any proposal with the government of Cambodia to resolve the OCA, let alone any proposal to settle the dispute in exchange for any private individual gains as alleged by Democrat Party Member of the House of Representatives Anik Amranand during the meeting of the National Assembly on Aug. 23-25. Cambodia and Thailand entered into a Memorandum of Understanding (MoU) regarding the area of their overlapping maritime claims to the continental shelf in June 2001, setting out an agreed area to be delimited and an agreed joint development area (JDA), it said. Both countries subsequently dedicated considerable attention and resources to implementing the MoU by establishing the Joint Technical Committee (JTC) and two working groups on delimitation and joint development respectively. The constructive discussions and negotiations between the two countries, which took place from 2001 to 2007, were extremely fruitful, giving rise to two alternate proposals for the JDA: Cambodia's break-through proposal and Thailand's three-zone proposal. However, the official talk on the issue between the two countries was in limbo during the former Thai government under Abhisit Vejjajiva's administration. "Even during the past few years when the JTC did not meet formally, the Abhisit government continued to engage the government of Cambodia in negotiations on the OCA on multiple occasions," said the statement. Cambodia's Prime Minister Hun Sen and former Thai deputy Prime Minister Suthep Thaugsuban and former Thai defense minister Pravit Wongsuwan held a meeting on June 27, 2009 in Cambodia's Kandal province. Behind-the-scenes discussions were also held between Suthep Thaugsuban and Cambodia's deputy Prime Minister Sok An in Hong Kong on Aug. 1, 2009 and in Kunming on July 16, 2010. "Mr. Suthep Thaugsuban indicated a strong preference to resolve this issue during the mandate of the Abhisit government," said the statement. PHNOM PENH (BNO NEWS) -- Cambodia is looking to resume talks with neighboring Thailand to resolve overlapping maritime claims in the Gulf of Thailand, the Cambodian National Petroleum Authority (CNPA) said in a statement on Tuesday. 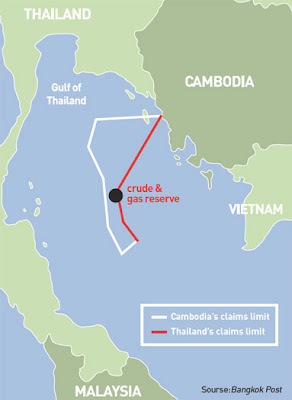 The Cambodian government body said it has "a firm commitment to finding an equitable and transparent resolution" to the overlapping claims area which consists of a 27,000 square kilometers (10,425 square miles) stretch of seabed which is considered rich in oil and gas. "The [government] would welcome the resumption of open and official negotiation on this issue and will pursue such a course as soon as practicable," the statement added. The CNPA statement also noted that the newly elected Thai government, led by Prime Minister Yingluck Shinawatra, has not held any meetings or raised any proposal with Cambodian authorities to resolve the overlapping claims area. It is the second time in just over a month that Cambodia is attempting to resume negotiations with Thailand about the disputed area. In June 2001, Cambodia and Thailand signed a Memorandum of Understanding, agreeing on the joint management and development of resources in the disputed zone. Subsequently, both countries put considerable efforts in implementing the agreement of a joint development area (JDA). According to the CNPA, the discussions held from 2001 to 2007 had been 'fruitful', giving rise to two alternate proposals for the JDA: Cambodia's break-through proposal and Thailand's three-zone proposal. However, the official talks on the issue froze during the administration of former Thai prime minister Abhisit Vejjajiva, who took power in 2008 and had rocky relations with Cambodia. In 2009, Cambodia and Thailand withdrew their ambassadors in what was the peak of the deterioration of diplomatic relations between the two countries. Cambodia expects to resume the negotiation talks with the newly formed government of Thailand as it hopes to obtain oil and gas revenues which could transform the economic situation in the impoverished nation. A number of major oil companies have already signed exploration deals with Cambodia in the Gulf of Thailand, including the U.S. firm Chevron Corporation and French multinational oil company Total S.A. Some stories take years to tell and thousands of miles to find. Steve Johnson found his story an hour’s motorbike ride out of the Cambodian capital Phnom Penh, where a Buddhist temple sits halfway up a small mountain. For the last two years, Johnson, a Riverside High School world history teacher, has spent his summers talking to natives about King Jayavarman VII, who ruled from 1178-1219 and was considered the greatest of the Khmer (Cambodian) kings. To find someone who knew the entire tale meant traveling to Wat Tamov temple, where a handful of Buddhist monks who survived Pol Pot’s Communist regime lived on the edge of a tiger sanctuary. More than a million Cambodians were killed when the Khmer Rouge took over in 1975, and “anyone that was educated or any kind of religious leader was hunted down and killed,” said Johnson, whose wife is Cambodian. The sun was rimmed in red, and shadows slipped across the roof of Wat Tamov as Johnson listened to an old monk tell the stories of King Jayavarman. The oral tradition was alive in Sav Sarong, who when asked his age through a translator, put it at somewhere between 90 and 100. Stories have a way of unraveling more stories. Between the tales of a legendary king, Johnson learned how Sav Sarong survived four years of genocide. “The Khmer Rouge wanted to kill him because they were trying to kill all the Buddhist monks and teachers. They wanted everyone to believe in Communism, and no one was supposed to have a religion,” Johnson said. While others fled across the border to Thailand, Sav Sarong found his own refuge in a cave deep in the tiger sanctuary. The tigers didn’t bother him, the monk said. They looked him in the eye and stalked away, but the Khmer Rouge weren’t so lucky. “The tigers killed two men who came looking for him and ate them, and after that, they never came up again,” Johnson said. Sav Sarong was the last piece of his research. In October, the Angkor National Museum in Cambodia will publish the high school teacher’s essay on King Jayavarman VII in English and Khmer. Strategy & Tactics magazine will carry the essay next year, available at all Barnes & Noble stores. Anna Lee can be reached at 298-4246. Abhisit sent his deputy Suthep Thaugsuban for talks with Cambodian leaders many times, including two behind-the-scene meetings with Deputy Prime Minister Sok An (pictured) in Hong Kong and Kunming in August 2009 and July 2010 respectively. Cambodia yesterday called for resumption of negotiations with the Thai government to settle the dispute in an overlapping area in the Gulf of Thailand and jointly develop the maritime resource, while also rejecting the Thai opposition Democrat Party's accusation of former premier Thaksin Shinawatra having a personal interest in the project. The Cambodian National Petroleum Authority issued a statement calling on Thailand to honour the memorandum of understanding (MoU) on the area of overlapping maritime claim signed by the two countries in 2001. The Mo aimed to jointly develop the area in the gulf, which is claimed by both sides and is believed to have abundant petroleum resources. The Abhisit Vejjajiva government decided to scrap the MoU signed during the time of the Thaksin administration after Thaksin was appointed Cambodian Prime Minister Hun Sen's adviser in November 2009. Abhisit accused Thaksin of having personal interest in the maritime deal and the likelihood of him disclosing information that would benefit Phnom Penh under the 2001 MoU. However, the denunciation of the MoU did not come into effect as the Abhisit government did not officially inform Phnom Penh of the decision. The Cambodian petroleum authority said in its statement that negotiations between the two countries during 2001-2007, before the Abhisit administration came to power, was fruitful. It said the negotiations resulted in many proposals for joint development of the area and profit sharing. The statement alleged that the Abhisit government tried to make a secret deal, which Phnom Penh disagreed with, on the maritime area. Abhisit sent his deputy Suthep Thaugsuban for talks with Cambodian leaders many times, including two behind-the-scene meetings with Deputy Prime Minister Sok An in Hong Kong and Kunming in August 2009 and July 2010 respectively. While asking for transparency from previous governments which had deals with Phnom Penh openly "why under the Abhisit government was there a need for secret meetings", it said. The opposition Democrats raised the question of Thaksin's personal business deal on oil and gas concession in overlapping area in the Gulf of Thailand in Parliament last week when the new government under Yingluck Shinawatra delivered its policy address. Thaksin, who is Yingluck's brother, had reportedly planned to visit Phnom Penh from August 19-21 but later changed his mind. The Cambodian petroleum authority accused Abhisit of attempting to derail negotiations between the governments of the two countries on the maritime deal. The Democrat allegations of Thaksin of having a personal interest is groundless, it said. "So far, the new government [under Yingluck] has not held any meeting or raised any proposal with Cambodia to resolve the overlapping area, let alone any proposal to settle the dispute in exchange for any private individual's gain," the statement said. Thaksin's legal adviser Noppadon Pattama said yesterday that the former prime minister, who is now in China after his high-profile visit to Japan, did not have any plan to visit Cambodia or any of Thailand's neighbouring countries. CAMBODIA’S Tourism Minister Dr Thong Khon recently dubbed tourism ‘green gold’ as he spoke of the industry’s importance to the country’s socio economic development. In 2010, Cambodia’s domestic tourists were up around eight per cent to 7.7 million while the number of international visitors rose by 16 per cent to 2.5 million. Of these around 1.7 million came from the Asia-pacific region, 463,000 from Europe and 182,850 from the US. And while numbers coming from Russia and India have been increasing steadily, the top 10 source markets were Vietnam, Korea, China, Japan, the US, France, the UK, Thailand, Australia and Taiwan. Dr Khon said that in 2010 tourism generated around $1.7 billion accounting for 12 per cent of the national GDP and employing 400,000 Cambodians. 'Tourism, as a system, is a priority sector which contributes to building up socio economic development, job opportunities, income generation, improvements in livlihood and poverty reduction. Adding that tourism is among the government’s top 10 priorities, Dr Khon said ‘it is considered as green gold while rice is referred to as white gold’ pointing out that the country is expected to attract around eight million international visitors per year by 2020 with around half of these heading for Siem Reap. The minister was speaking at a ceremony to mark the renaming of the five-star Angkor Palace Restort & Spa in Siem Reap as the Grand Soluxe Angkor Palace Resort & Spa (pictured) following the property’s partnership with Soluxe Hospitality Group, the Singapore-based international hotel chain which is owned by China National Petrolium Corporation. Welcoming the group Dr Khon said the United Nations World Tourism Organisation forecasts Chinese outbound tourism will reach 100 million travellers per year by 2020, of which Cambodia expects to receive around 1.2 per cent. 'I strongly hope that this new brand name will attract more international tourists, especially Chinese, to visit Siem Reap and the rest of Cambodia,' he said. And praising the hotel’s achievement in reaching the ASEAN Green Hotel Standard Dr Khon said he hoped the new management would keep up the good work in helping turn Siem Reap into a model tourism eco-city. Mitsui O.S.K. Lines, Ltd. (MOL; President: Koichi Muto) has announced that it has received a commendation from the government of Cambodia for its support of a project to supply the nation with medical vehicles and equipment in Phnom Penh. MOL co-operated with non-profit organization (NPO) Side By Side International (SBSI)* to transport 34 medical vehicles and other equipment to help the nation develop an emergency first-aid system. Starting in June 2010, the vehicles and equipment were delivered to five medical facilities in Cambodia, including two national hospitals, and are now playing a vital role in front-line emergency response. The Cambodian government honored three organizations for their roles in the project — The Nippon Foundation, which supplied the vehicles, SBSI, and MOL. The commendations were presented at a ceremony, attended by about 300 people from police and fire departments, the Ministry of Health, hospitals, and the military. “We express our thanks on behalf of the royal government for your continual co-operation and generous efforts for establishment of Cambodian emergency first-aid system,” said His Excellency Om Yentieng who is Senior Minister, Deputy Director of National Counter-terrorism Committee (NCTC), in presenting the commendation to MOL. The event received extensive coverage on Cambodian television and in leading newspapers. MOL set “Contribution to Local Communities” as one of its social contribution activities’ principles and takes a proactive stance in the activities unique to an ocean shipping company with a global network, and seeks sustainable growth in synergy with societies around the world. Family members say Cambodia's Vann Nath, one of only seven survivors of a vast and notorious Khmer Rouge torture center, is in a coma and near death at a Cambodian hospital. 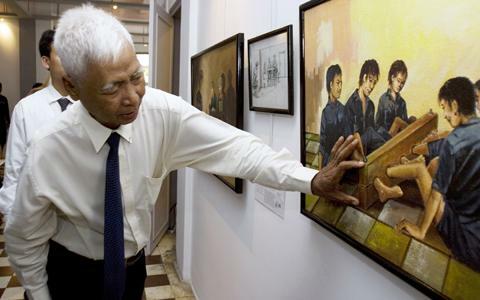 The 66-year-old human rights icon and artist survived the infamous Tuol Sleng prison, where more than 12,000 people died in the 1970s under Khmer Rouge rule. He was hospitalized Friday with an apparent heart attack, and a senior hospital official in Phnom Penh said Tuesday there is little hope for his survival. News of Vann Nath's illness comes as an international tribunal prepares to begin the long-awaited trial of the four most senior surviving Khmer Rouge leaders — all charged with atrocities during the group's 1975-1979 rule. The defendants, including the nominal Khmer Rouge head of state, 79-year-old Khieu Samphan, face charges of religious persecution, torture and genocide in the deaths of as many as 2 million people. Vann Nath's health crisis also comes as the tribunal deliberates a verdict for war crimes suspect Duch, the one-time chief of Tuol Sleng prison. Duch was convicted of war crimes and imprisoned earlier this year for 30 years — a sentence later reduced to 19 years because of time served in detention. He has appealed his conviction. 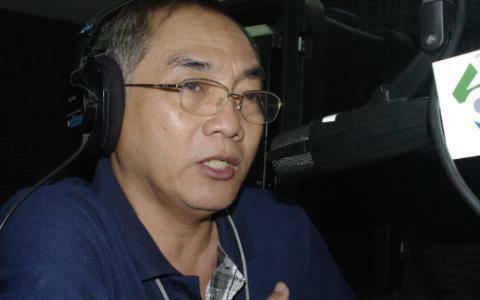 Vann Nath is widely seen as a leading advocate for victims of Khmer Rouge atrocities. His 1998 memoir — A Cambodian Prison Portrait: One Year in the Khmer Rouge's S-21 Prison – is the only written account by a survivor of the prison. The book has been translated from English into French and Swedish. FEARS of a new outbreak of bird flu have been raised by the United Nations, following the emergence of a mutated strain of the disease that is able to sidestep vaccines. The avian flu variant has appeared in Vietnam and China and its risk to humans cannot be predicted, say UN veterinary officials. It could also threaten Thailand, Malaysia and Cambodia, where eight people have died after becoming infected this year, they warned. 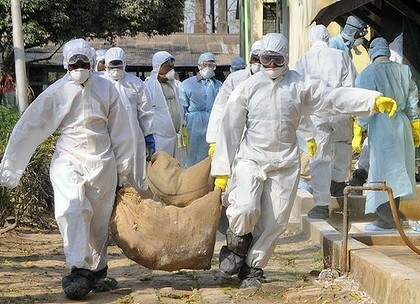 The World Health Organisation says avian flu has killed 331 people since 2003. And more than 400m domestic poultry worldwide have been killed or culled as a result of the virus, causing an estimated £12.2bn of economic damage. Experts in Wales said yesterday the new strain of the virus is unlikely to have an impact on the health of humans in Britain. And the Welsh Government reassured the public that the country had “strong contingency plans” in place to prevent and tackle any potential outbreak. At its peak in 2006, there were 4,000 outbreaks of avian flu in 63 countries across the globe. The H5N1 virus has since been eliminated in most territories, but it remains endemic in Bangladesh, China, Egypt, India, Indonesia and Vietnam. The UN’s Food and Agriculture Organisation called on countries to adopt “heightened readiness and surveillance” against a resurgence of the virus. In the past two years, avian flu has appeared in poultry or wild birds in countries that had been virus-free for some years. Dr Roland Salmon, the director of Public Health Wales’ communicable disease surveillance centre, said the development of a mutant, vaccine-resistant strain of bird flu should not cause alarm. “I don’t think this has a great deal of human health implications. “Any problem that you’re likely to see in Britain is almost certainly going to kick off among British poultry, rather than among humans. “You’re not going to suddenly get 50 people in Britain infected with bird flu, but you might get a flock of birds here infected,” he said. Australian David Wilson (L), Frenchman Jean-Michel Braquet (C), and Briton Mark Slater (R), were captured and executed by the Khmer Rouge. A new witness has come forward in the coronial investigation into the 1994 Cambodian murder of tourist David Wilson. The Coroner's Court has been approached by a man who is working in Western Australia, who claims to have received new information relevant to Mr Wilson's death while he was working in Cambodia between Febraury and May last year. Mr Wilson was murdered by the Khmer Rouge after being kidnapped and held hostage in late 1994. An inquest into his death began in 1998 but had been adjourned until today. Deputy State Coroner Iain West has taken over the investigation from the former state coroner Graeme Johnstone. Counsel assisting the coroner Ian Freckleton SC said this morning that Darryl Hockey had come across the new information while living and working in Southern Cambodia last year. Mr Wilson was one of three men abducted by the Khmer Rouge; the others were Frenchman Jean-Michel Braquet and Briton Mark Slater. The men's kidnappers made demands for payment for their safe return but the then Keating government did not meet their demands, saying that Australia did not negotiatie with kidnappers. Dr Freckleton told the coroner said although Mr Hockey's information was “pertinent”, given the fact that it was received several years after the murders and it was of a hearsay nature it should be placed on the inquest brief but Mr Hockey not be called as a witness. Dr Freckleton said substantial information and documents had become available since the inquest first sat, which meant no further witnesses needed to be called. Mr West adjourned the inquest to a date to be fixed and will allow for a witness, former Department of Foreign Affairs and Trade employee Alastair Gaisford to apply to become an interested party. This would allow him to present evidence and potentially other witnesses. The family of Mr Wilson were not present in court today, having told the Sunday Age last week that they do not want to be involved and were trying to get on with their lives. It was two o' clock in the morning when Armin Kluge stepped off the train in Redditt, into the wilderness that would lead him back to Toronto. The next morning, his mind was on the Cambodian students he would help attend school as he mounted his bicycle and his trek began. That was a year ago and on Friday, he saw Kenora at the end of that journey. At 70 years old, cycling across Canada was becoming a "now-or-never" prospect for the pensioner. Kluge pedalled all the way to Toronto, went back to Angkor Peak Sneng Junior High School built by his childhood friend from Germany for the third year in a row and started training immediately upon his return. This spring the second leg of the trip began in front of the lens of a CBC camera in Vancouver's Stanley Park. Making it back to Kenora made him reflect on his renewed faith in humanity that has motivated him to keep going. "I've had a tremendous experience," he said. "It has helped me grow. It has reinforced my strong belief that we, as a society, as humanity, are making good progress to make the world a better place." Kluge had set himself the goal of fundraising a dollar for every kilometre of road he covered. With Ontario and the West now covered, he is bringing in far above that, giving an opportunity for Cambodian children to attend school at $300 CDN each. "It grows on you," he said of the rural, South Asian town. "The need those children have — for us, it feels like the stone age. The village where the school is built doesn't even have electricity. Words are difficult to describe but those people are not unhappier than we are and they have absolutely nothing." He stayed in Kenora for a couple of days over the weekend to meet local people and pass along the knowledge and experience he gained over the course of his ride. "I like to do my part to give people inspiration for what I, as a single human being with no special qualities can accomplish when I set my mind to it," he said. A new draft law to regulate NGOs will have an adverse affect on government criticism, a leading rights activist said Monday. The NGO law, which was approved by the Council of Ministers this month to wide rebuke among rights and development workers, contains provisions that critics say make organizations vulnerable to government attack. Sok Sam Oeun, executive director of the Cambodian Defenders Project, told “Hello VOA” Monday that the law will also have a silencing affect on some NGOs that are traditionally critical of government policies or abuse. While some government officials are not overly sensitive to such criticism, “low-level, malicious officials” see it as an attack on their political party, he said. With a law behind them, these officials could make problems for organizations, he said. The law, which must now be approved by parliament, contains provisions that can slow development work, such as excessive registration and reporting requirements, he said. NGOs are funded with donors who have benchmarks, so there is no need to worry about their operations, he said, and there are already enough laws on the books to close NGOs that are operating illegally. The law has received widespread criticism from international and local communities, including calls for donors to review their assistance to Cambodia if it passes. A spokesman for the Council of Ministers said that other countries have regulations for organizations, so this law will not likely affect foreign assistance. BANGKOK (AlertNet) – A Cambodian government spokesperson has defended a controversial law aiming to regulate non-governmental organisations (NGOs), and has slammed critics who have urged foreign donors to consider a funding-freeze if the law passes in its current form, the Phnom Penh Post reported. A coalition of 10 NGOs including Human Rights Watch, Global Witness and Freedom House has angered Cambodia - which relies on foreign aid to cover as much as 60 percent of its spending - by writing to 36 foreign ministers of major donor countries and the European Union last week. The letters urged donors to press the Southeast Asian country to not pass the law, and to reassess assistance if it is passed. The law, in its third draft, is currently before the Cambodian Council of Ministers for consideration. “What else do they want? We just want to have a proper law to regulate their operations to follow the rule of law in the country where they are operating,” Ek Tha, a spokesman and deputy director of the press unit at the Council of Ministers, told The Post by e-mail. “I wish we had foreign NGOs and human rights activists voice their concerns in the 1970s when we were being treated badly under the Khmer Rouge regime,” he said. Among concerns raised over the current draft, the UK’s Guardian newspaper has pointed to the law’s mandatory and complex NGO registration, a lack of safeguards to ensure objectivity in registration denials or involuntary dissolutions, the absence of a period for an appeal process when registration is denied, and many sections in the law being vague. “As written, the current draft law empowers the government to violate fundamental rights and does little to protect state or social interests,” it said. The letters came at a time of rising tensions between NGOs and Cambodia’s government. In recent weeks, the Foreign Ministry warned an umbrella organisation of 88 NGOs over a letter it wrote to two donors about the impact of a railway refurbishment project on people who were resettled, suspended an NGO that signed the letter for allegedly inciting villagers to protest against the railway project and summoned another to meet with officials. Last week it also postponed indefinitely a top-level meeting with foreign donors. This followed an announcement that the World Bank has halted loans to the government over its failure to curb forced evictions. Supporters of the draft law say, in a country of only 15 million people, it would help regulate a sector accommodating more than 3,000 NGOs and associations – according to some estimates – that work on issues ranging from health, education and infrastructure to environmental protection and governance. The large number of NGOs in Cambodia has raised questions about their own levels of transparency and accountability as well as the hefty salaries earned by expatriate staff in the impoverished country. Critics have said the law is an attempt to muzzle a burgeoning civil society that has become openly critical of Hun Sen – who has been prime minister for the past 25 years – and his ruling Cambodian People’s Party. 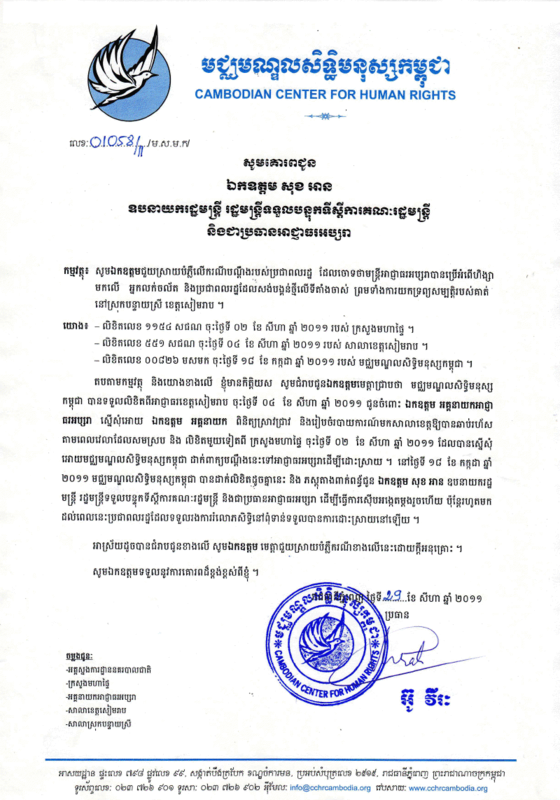 The NGOs behind the latest letter also said a new Civil Code, which will take effect in November this year, already has provisions on the registration and operation of non-profit entities in Cambodia. The international community pledged $1.1 billion in aid for Cambodia last year, an increase from the previous year's commitment of $990 million. That figure is dwarfed by investment pledges by Chinese firms, which agreed to spend $8 billion in 360 projects in Cambodia in the first seven months of this year. Despite the fact that no dead bodies have as yet been produced, Libyan rebels are almost certain that Khamis (pictured), the Libyan dictator Muammar Al Qathafi's son and his intelligence chief Abdullah al-Senussi have been killed during fighting with their units. If true, their deaths would mark the highest-profile casualties on the Al Qathafi side since an uprising began six months ago aimed at ending fugitive Al Qathafi's 42-years rule in the country. Top rebel military spokesman Ahmed Bani has been reported saying: "We have almost certain information that Khamis A: Qathafi and Abdullah al-Senussi were killed on Saturday by a unit of the national liberation army during clashes in Tarhouna (90 km southeast of Tripoli)." Bani has been reported telling the pan-Arab channel Al Arabiiyah, "Khamis Al Qathafi was buried in Bani Walid,"
Khamis has been reported dead twice before this latest, during the uprising, only to reappear, on television as to proof he was alie each time. Mustafa Abdul Jalil, who heads the rebel National Transitional Council, said on Monday that he did not have any official information about Khamis's death. Claims about the death of Khamis - leader of the notorious Khamis Brigade - come as the Algerian foreign minister said the dictator's wife and three of his other children had now escaped to that country. This is the third time that reports claimed Khamis, commander of one of the government's most loyal and best-equipped units had been killed, the last time was on August 5. The first just days after the start of the uprising, in March. If confirmed, the death of Khamis would be a severe blow to his father's campaign to resist a six-month-old uprising. He is currently in hiding as the rebel forces currently occupy over 90 percent of the country and are set to attack his hometown of Sirte. Khamis used to command a brigade of around 10,000 men. It used to be described by analysts as Libya's most effective unit and a central part of the security apparatus. It was used to be considered the best equipped and most capable of defending the regime. Earlier in the conflict, in March, there were the first reports that Khamis had been killed in a kamikaze crash by a disaffected Libyan air force pilot. Khamis would be the second of Al Qathafi's sons reported killed since the uprising against his 42-year rule began in February. The first was Seif al-Arab, the victim of a NATO air-strike. Colonel Al-Mahdi Al-Haragi, in charge of the Tripoli Brigade of the rebel army, said earlier that he had confirmation that Khamis, who commanded an elite brigade suspected of atrocities, had been badly wounded and died of his wounds in hospital. A US official, speaking on condition of anonymity, told Reuters the United States could not yet independently confirm Khamis's death but said similar information was being received in Washington from "reliable sources." Earlier on Monday, prosecutor Luis Moreno-Ocampo of the International Criminal Court (ICC) said may apply for an arrest warrant for Khamis, accusing him of crimes against humanity. Human Rights Watch said members of the Khamis Brigade, a force commanded by him, appeared to have carried out summary executions of detainees whose bodies were found in a warehouse in Tripoli. The Hague-based ICC has already approved warrants for the arrest of Muammar Al Qathaf, another of his sons, Seif al-Islam, as well as intelligence chief Senussi on charges of crimes against humanity. Khamis is also said to have been was wounded in a 1986 US air attack on Tripoli ordered by President Ronald Reagan. However, he took up a military career as commander of the 32nd Brigade, one of Libya's best equipped military formations that played an important role in the government's counter-insurgency campaign. BANGKOK, Aug 30 (MCOT)-- Thai Defence Minister Gen Yuthasak Sasiprapa said on Tuesday he is scheduled to visit Cambodia in late September to hold unofficial talks with his Cambodian counterpart on the International Court of Justice's order in preparation for the Thai Cambodian General Border Committee (GBC) meeting, according to Defence Ministry spokesman Col Thanathip Sawangsaeng. Col Thanathip said that Gen Yuthasak would invite Prime Minister Yingluck Shinawatra to chair a meeting of the National Security Council (NSC) within two weeks to be briefed on the guidelines for the GBC meeting to be brought to cabinet and Parliament for approval to authorise the defence minister to hold talks with Cambodia. The defence spokesman said that Gen Yuthasak would visit Phnom Penh late next month to hold unofficial talks with his Cambodian counterpart Gen Tea Banh who co-chairs the GBC. The discussion is expected to focus on troop redeployment and international observers, he said. The International Court of Justice (ICJ) on July 18 ordered Thailand and Cambodia to withdraw their troops from the newly defined demilitarised zone in a disputed portion of their border around the ancient Preah Vihear temple while urging both countries to work with the Association of Southeast Asian Nations (ASEAN) to reach an agreement to allow the regional bloc's observers to enter the disputed zone. Col Thanathip said that at the GBC meeting, both sides could clarify forces to replace the soldiers around the Preah Vihear Temple in accordance with the World Court order. Gen Yuthasak will pay a courtesy call on Cambodian Prime Minister Hun Sen during his visit, the ministry spokesman said. Meanwhile, Gen Yuthasak said the Cambodian Defence Ministry invited him twice to visit the country and he personally believed that the visit would be a good opportunity to familiarise himself and have unofficial talks as a prelude to make the GBC meeting run smoothly. Defence Minister Yutthasak Sasiprapa said on Monday he will soon visit Cambodia at the invitation of Cambodian counterpart Tea Banh for informal talks to lay the groundwork for the long delayed General Border Committee (GBC) meeting. Gen Yutthasak said both Thailand and Cambodia were satisfied with the results of the Regional Border Committee (RBC) meeting in Nakhon Ratchasima on Aug 25, but the two sides had not reached any agreement. Decisions were pending approval from the cabinet. The Defence Ministry would compile a list of matters discussed at the RBC meeting and submit proposals to the National Security Council for consideration. The NSC, chaired by Prime Minister Yingluck Shinawatra, could then call a meeting of security agencies before forwarding recommendations to the cabinet for approval, he said. "During this time I will make an unofficial visit to Cambodia at the invitation of Gen Tea Banh. "We will discuss adjustments to the deployment of combat units and arrangments for (Indonesian) observers, in preparation for the GBC meeting. "Approval of issues discussed would then be sought from the cabinet," Gen Yutthasak said. Defence spokesman Col Thanathip Sawangsaeng said Gen Yutthasak would pay a courtesy call on Prime Minister Hun Sen in Phnom Penh and might also seek an audience with King Sihamoni. Col Thanathip said in about two weeks Gen Yutthasak would invite Ms Yingluck to attend an NSC meeting to lay down a framework for the GBC meeting. Issues to be discussed at the GBC meeting would then be forwarded to the cabinet and then parliament for approval and to give the defence minister the authority to represent Thailand. Gen Yutthasak would also hold a meetings in rotation with the Defence, Interior and Foreign Affairs ministries to discuss problems relating to illegal drugs, the southern border provinces and deployment of officials, troops and equipment to help flood-hit people, he said. PHNOM PENH, 30 August 2011 (IRIN) - Building local resilience will prove key to better addressing the effects of climate change in Cambodia, this year's Cambodia Human Development Report (CHDR) states. "Local action and local solutions are what is needed most," Tin Ponlok, deputy director-general of climate change for the Cambodian Ministry of Environment, told IRIN. "This is where we can make the most difference." Released on 30 August, the report, Building Resilience: The Future for Rural Livelihoods in the Face of Climate Change, identifies climate change as a threat to human development gains and a source of increasing vulnerability for Cambodia's poor. About 80 percent of Cambodia's 14 million people live in rural areas, where the vast majority depend on agriculture as their primary source of livelihood. According to the UN Development Programme (UNDP), shorter and more intense rainy seasons, combined with longer and drier seasons, are expected to significantly alter the country's agricultural landscape. Predicted rises in temperature could have devastating effects on the rice crops on which many rural livelihoods rely. Studies in the region suggest rice production, a staple part of the Cambodian diet, could decline significantly with a one degree Celsius rise in temperature, making rice farming unviable for many, the CHDR report says. "Seasonal practices are now changing and the growing cycle for rice is changing more and more," said Richard Friend, co-author of the report, noting the potential impact this could have on Cambodia's overall rice output. "Many farmers lose their seedlings when the rains are delayed," he said. "The rains appear to be coming later than usual in line with climate change projections for Cambodia and the region." About 80 percent of Cambodia's rice output is rain-fed. Speaking at the report's launch, Deputy Prime Minister and Minister of Economy and Finance Keat Chhon said although climate change was already high on the government's agenda, it must now be thoroughly incorporated into strategic policies and action plans across all sectors at the national and sub-national levels to build future resilience. "This needs to be done particularly in the sectors that are the backbone of the national economy such as agriculture, water resources, fisheries, forestry, energy and physical infrastructure," he said. The report argues for a well coordinated effort to build climate resilience among the country's rural population in four key areas: water resources, agriculture, forestry and fisheries. In 2010, delayed rains demonstrated the extreme dependence of rural people's well-being on the regularity of seasons, controlled by the climate, and the availability of natural resources such as water. The late onset of last year's rainy season resulted in record-low water levels in the Tonle Sap and Mekong rivers at a time when many poor farmers were still reeling from the loss of their crops to Typhoon Ketsana in 2009, the report explained. DREDGING operations are causing whole sections of farmland along Svay Rieng’s Toek Vel River to collapse, villagers said in a petition thumb printed by more than 300 affected families. Ros Mov, a chief of Romeas Hek Samiky Land Community, said yesterday 389 families from four communes in Romeas Hek district – Koki, Doung, Ampil and Kampong Trach – were worried their farmland would be washed away. “We are alarmed that our farmland on the river bank has been collapsing since Vietnamese boats began dredging on the Toek Vel River,” she said, adding that they had filed their complaint to the provincial hall. CAMBREW yesterday paid the beer promoters who went on strike in late July to demand that the company abide by an Arbitration Council ruling earlier that month that said it owed the women three years of overtime for working on Sundays. “All the beer promotion girls who protested are already back to work, and today we will pay those who started the protest,” Cambrew executive Gneap Chheng Leap told a press conference. The company, which is half owned by Carlsberg, said it would also pay overtime of US$2 for every Sunday worked to beer promoters who did not join the strike. All 602 of them will receive payment on September 5 for every Sunday they worked over a more than three year period, Cambew said. “We will compensate US$2 [for every Sunday worked] for all beer girl promoters in the country for the period between November 2007 and December 2010,” Cambrew executive Chu Jung Kim said. Because of a rescheduling of working hours, none had worked overtime this year, he said. Yesterday’s announcement followed discussions with the Trade Union Personnel Workers’ Progressive of Angkor Beer, an internal union, company executives said. The Cambodian Food and Service Workers’ Federation, the union that led the strike and mobilised international pressure on Carlsberg, was not invited to yesterday’s press event. Even so, the federation’s president, Sar Mora, welcomed the decision by Cambrew, saying he was pleased it had rectified its mistake and that this could encourage other brewers in the Kingdom to abide by the country’s labour laws. Gneap Chheng Leap also denied allegations that seven beer promoters had been moved to less popular venues to punish them for striking, saying that they had been replaced while striking because the venues they had left needed staff. 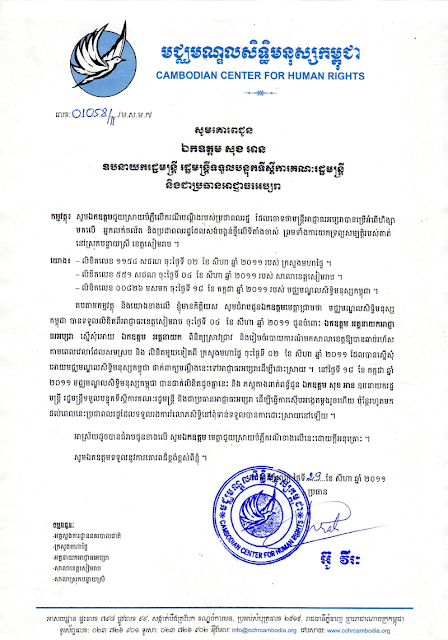 The beer promoters began their strike in front of the company’s Phnom Penh office on July 25, following a ruling from the Arbitration Council earlier that month that said Cambrew owed them $2 in overtime for working on Sundays, and that payment was retroactive for three years. The protest drew media attention in Cambodia and Denmark, where Carlsberg is based. Intense pressure from international unions was exerted on Carlsberg to encourage its Cambrew to find an equitable end to the strike. THE National Bank of Cambodia has issued a commercial banking licence to a Taiwanese bank, while another banking licence is pending approval for a Chinese-Cambodian joint venture, central bank Director General and Spokeswoman Ngoun Sokha said yesterday. The central bank had lic-ensed Taiwan’s Mega Internat-ional Commercial Bank to set up in the Kingdom, she said. While the sector is steadily advancing, Ngoun Sokha she was not concerned about there being too many banks, adding that additional banks are required to attract further foreign investors to the market. “If the market is narrow investors won’t come. Before investment decisions are made, they research and analyse the industry in a country,” she said. She added that the investors had already analysed the secotor, and they saw opportunity to develop the banking industry. Mega International Commercial Bank has met the NBC’s capital requirements, according to Ngoun Sokha. Although company officials could not be reached for comment late yesterday, it is believed to be setting up a branch near the Independence Monument, in the capital’s Chamkarmon district. The NBC was also considering a licensing application for the Cambodia Export-Import Bank, although it had already green-lighted the venture in principle, she said. 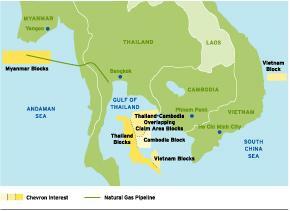 The bank, which Ngoun Sokha says is to be privately owned, is a joint venture between Chinese and Cambodian investors. She declined to reveal the names of the investors yesterday until the licence was finalised. There are 29 commercial banks, six specialised banks and 27 micro-finance instit-utions operating in the country, according to the NBC’s first-half 2011 report. Yesterday, University of Cambodia economics and business lecturer Chheng Kimlong said the Kingdom offered opportunities for banks compared with more mature markets. “They see opportunities to profit from Cambodia’s high interest rates compared with other countries,” he said. Competition in the industry from more banks would ultimately benefit clients, he said.